As if our summer vacation wasn’t full enough, we had the opportunity to go to Kings Dominion the day we got back from our New England Vacation. Grandad’s work takes the employees and their families every year to Kings Dominion for the day, and for the past few years, we’ve managed to weasel our way into this trip as well. This year was extra fun cuz brother Bear, auntie M and cousin Owen joined in the fun as well. I am not a fan of the jaundiced rhombus, but the kids were happy to be photographed with him. Grandad had a great time watching the grand kids and riding the rides. He’s quite a spry sexagenarian. 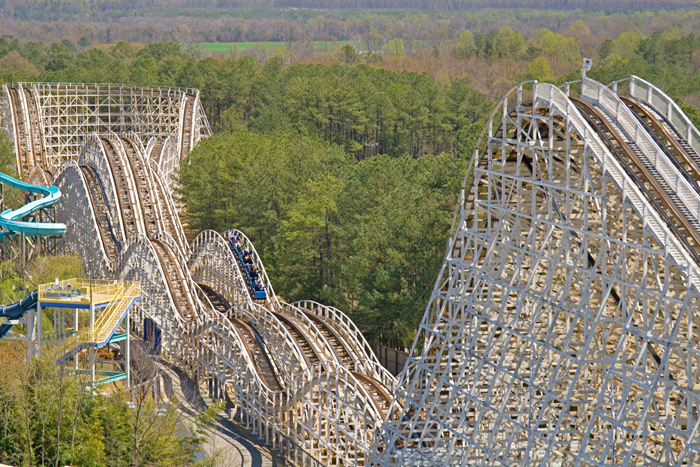 Kings Dominion, unlike Storyland, is a full-fledged theme park, intended largely for the over 48″ crowd. Despite that, there were a number of rides the little ones could enjoy. The old fashioned cars was one such ride. The double triple stroller was another. The Flying Eagles were a big hit with everyone except Daddy (cuz Daddy don’t do circles). The Log Flume was also a lot of fun. This was the best shot I could take during the ride. But I caught this one of B, M & O on the big drop at the end (pre splash). I’ve been to KD many times, just about every year as child on the swim team. This year was one of the best times I can remember in terms of being a perfect combination of gorgeous weather and hardly any crowds. We were literally able to walk onto ride after ride. Since we had a good ratio of grown-ups to kids, we were able to sneak in some adult rides as well. Mike & I rode the Grizzly, and Barrett & I rode the Dominator three times in a row. Bear, Mel, Mike & I all rode the Drop Tower – a 305′ tower which simulates sky diving as you drop 72 mph. I don’t know which was scarier – the feeling of free falling, or the site of Grandad supervising four Grandkids 5 and under 🙂 . At the end of the day, Mike & I rode the Rebel Yell – as much as I love some of the newer coasters, the old wooden Rebel Yell will always be a favorite of mine. After a while, we took a break and had lunch, courtesy of the Grandad’s employer at the picnic pavillion. It was great to not have to pay for lunch or parking! Then it was on to Kidzville, where there were tons of rides the kids could do – without any adults being forced to go around in circles. (Click to view pics larger). KD has a bumper cars just for little kids and this alone was worth the price of admision. We were in tears laughing at the kids driving around. Half of them can’t figure out how to steer and accelerate, so they either get stuck against the wall or do donuts until someone else crashes into them. However, those that figure out how things work take great delight in crashing into their brother and cousin. Fortunately, they liked it too. As I mentioned, the kids were too small for most of the real roller coaster rides, but there were a couple they could ride. One was the Scooby Doo Coaster – another ride I remember fondly from my childhood. Both Wendy & Sam were big enough to ride this and they loved it. We rode it over and over again. Wendy even tried holding her hands up for the whole ride – it was so cute. Barrett took a lot more great photos too – feel free to read his account of the day. We finished out our day with a stop in the Water Works area. It was nice to cool off in the lazy river and wave pool. Alas, I have no pictures from this part because I actually put away my camera to enjoy the moment. I had so much fun riding rides with my kids and watching them have a blast doing everything. Despite the long day, they were very well behaved and had hardly any meltdowns. We spent about 8 hours at the park and came home exhausted. The next day, the kids woke up asking, “When can we go back to Kings Dominion?” The answer is, “It’ll be a while.” But I can’t wait either.